The Coral Sea occupies that part of the Pacific Ocean off the east coast of Australia between the parallels of Sandy Cape and Torres Strait, bounded by the SW coast of New Caledonia to a line drawn to the Louisiade Archipelago and south coast of Papua New Guinea. 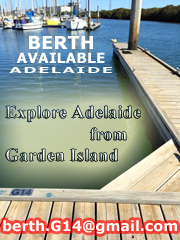 This guide covers only those reefs and islets within Australian territory. A fast, unobstructed passage to Cape York. Unlike the GBR, superb diving in clear water without jellyfish, great fishing, heaps of wildlife, solitude. 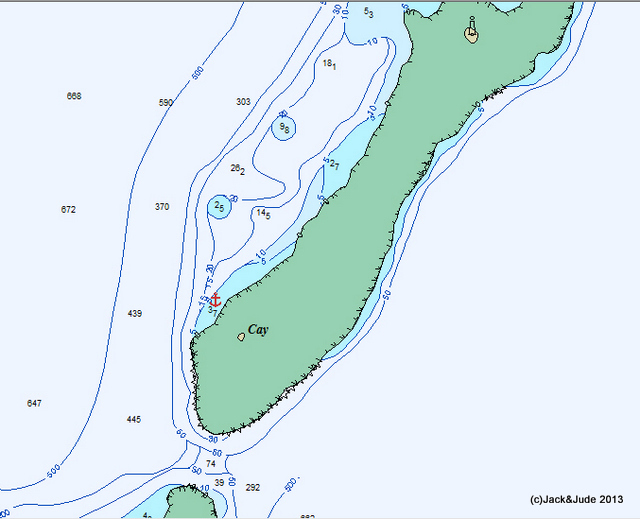 Anchorage positions marked in GREEN are from our personal experiences during our five-week voyage through the Coral Sea in June/July 2013. Anchorage positions marked in MAROON are from our personal experiences in five voyages around the Coral Sea in the 1970s and 80s. Every year Jack and Jude purchase additional recording equipment to help bring planet Earth closer to yachtsmen and armchair travellers in the hope that others will find the same joy and amazement as we do. Maybe together we can help protect Earth and her creatures from mankind’s population explosion. 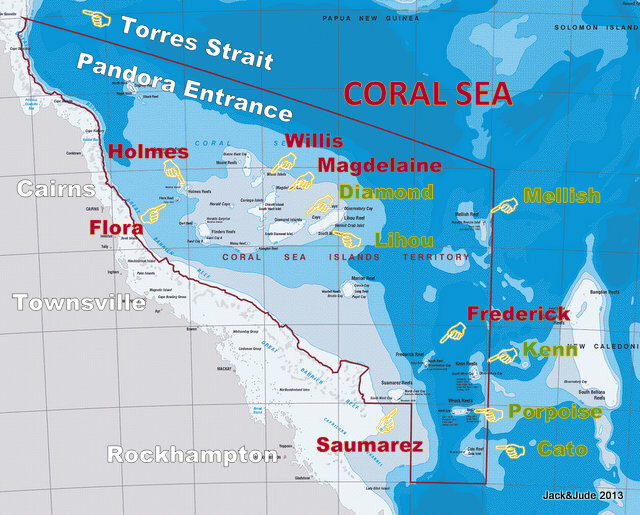 This is NOT an exhaustive or a complete listing of all Coral Sea anchorages. All GPS positions are approximate. Mariners are advised to be prudent and not to trust this information without proper diligence. Although every effort has been made to check the accuracy of the details, the editors and authors do not imply or accept any responsibility for the accuracy, authenticity, or validity of the contents. INTERNET is NOT available once mainland Australia is left behind. Sat phones / Yellowbrick trackers can send messages, and Marine Band frequencies have good reception. Therefore facilities such as Sail Mail should perform satisfactory. VHF signals DO NOT reach mainland repeaters. In winter, during April to about November, the weather will be predominately South East Trade Winds that are often reinforced during the months of June, July, and August when they can reach 25 to 30 knots. Tasman Sea swell may invade during and after southern storms. The summer months of December thru to April are the most prone to cyclonic activity, but are also the calmest time. We have sailed the Coral Sea in December and February, finding the weather reports adequate warning if not too far offshore. The Australia Bureau of Meteorology does NOT directly broadcast Coral Sea weather on HF, but it can be deduced from two sources. The first being Queensland Coastal forecasts broadcast by “VMC” from east Australia. The second being the Mean Sea Level Pressure weather fax maps broadcast by VMC. Coastal waters weather forecasts are repeated every four hours and contain up-to-date forecasts, warnings, and coastal observations. In addition, on the hour EST, VMC broadcasts coastal and high seas WARNINGS. On board Banyandah, we use the decoder program JVComm32 to produce a graphic image from the FAX signal received from VMC on our HF radio. It is really simple to set up using a two-wire connection from the external speaker plug on our HF to the microphone jack on our laptop. These are the same weather maps that are available from the BOM website. 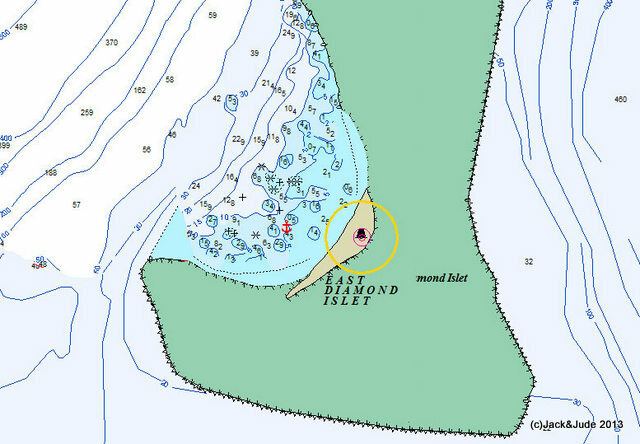 A small oval-shaped island lying about approximately 230 nm east of Gladstone, Queensland and about 145 nm east-southeast of the southern end of the Great Barrier Reef. 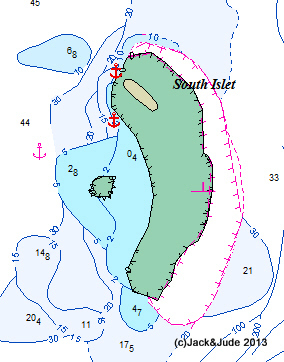 This island is approximately 62 nm south of Porpoise Islet, part of the east end of Wreck Reefs. The island lies on the western end of an oval-shaped reef enclosing a lagoon. The lagoon contains numerous coral heads. The sea breaks over the reef in all weathers. The reef lies on Cato Bank, which falls away steeply on all sides. The island is a mound of coral debris and grit 6 m high covered in grass and creepers up to 1 m high. An automatic weather station, with two radio masts and a silver-painted hut, stands on the northeast end of the island. The island is almost entirely surrounded by reefs with two narrow boat passages through the reefs on the northern side. 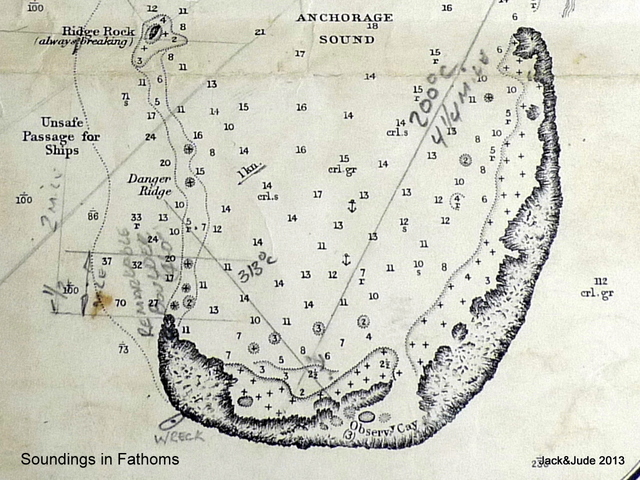 1/ Best passage is at east end of island opposite weather shed and marked by stake midway. Protected from E through S winds in 15 m sand patches amongst coral. Protected from ESE through S winds in 18 m sand patches amongst coral. Protected from ENE through S winds in 12 m sand patches amongst coral. 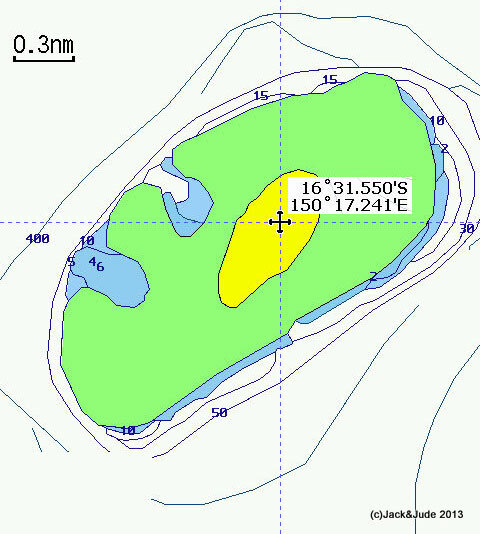 Hutchison Rock, 23°15’S 155°36’E, with a depth of 5.5 m, lies 2 nm east of Cato Reef. Wreck Reefs are a narrow, 18 nautical mile long chain of low-lying coral reefs and sand cays in the southern part of the Coral Sea that contain West Island, Hope Cay, Porpoise Cay and Bird Islet. 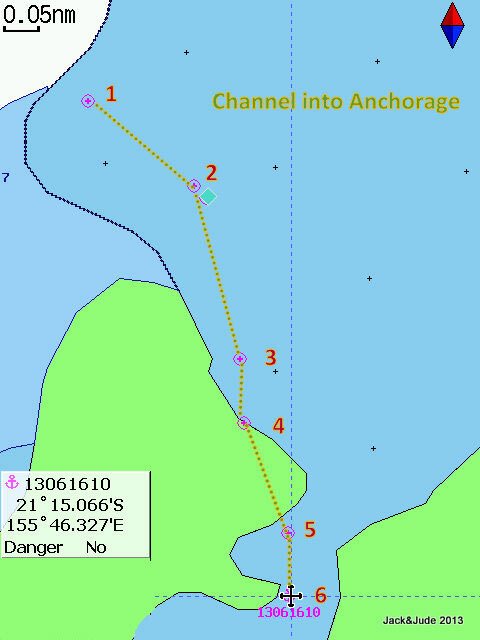 They lie approximately 180 nm NNE of Sandy Cape on the northern tip of Frazer Island, and approximately 230 nm east of Gladstone. The reef gained its name through the sinking of the colonial sloops Porpoise and Cato which were lost on Porpoise Reef. Matthew Flinders had left Port Jackson as a passenger in the Porpoise in 1803 after the Porpoise had been refitted to carry the plants and papers collected during his circumnavigation of Australia. They were accompanied by the Cato and Bridgewater. Eight days later, 17 August, disaster stuck when the Porpoise and Cato collided with uncharted reefs to which this incident then gave its name. The wrecks of these vessels are of great historic significance and lie within a historic wreck site protected from unauthorized interference. An overnight sail took us to Wreck Reefs, 67 nm north of Cato, where again we experienced poor conditions, too dangerous to snorkel over the historical wreck site of HMS Cato and Porpoise. Early summer would be the best time to explore them. When the light nor-easterly breeze shifted south, to our great delight we found a niche out the reef adjacent to the cay on its north side, sufficient to anchor Banyandah in 12 m coarse sand, coral heads on all sides except for the hundred metre wide entry. Well protected from trade winds, the water was nevertheless quite active. We explored Porpoise Cay, 275 m long, 90 m wide and 3 m high, vegetated with low grass and a succulent similar to Pig’s Face without pink flowers. White Masked Boobies were courting and nesting on its sandy fringe while brown Common Noddies nested within the foliage. About 20 pairs of Brown Boobies watched from the half tide rock on the windward edge. Pieces of black coal along the flotsam line lay amongst mankind’s bits of plastic, and embedded in the congealed half tide rock, bits of metal were rusting away. The coal and metal very likely from the wrecks. Find a sand patch amongst the coral in 16 m, some swell. An overnight passage from Porpoise Cay took us 65 nm to Kenn Reef, where the lessening easterly breeze evaporated, leaving a blissful calm sea. 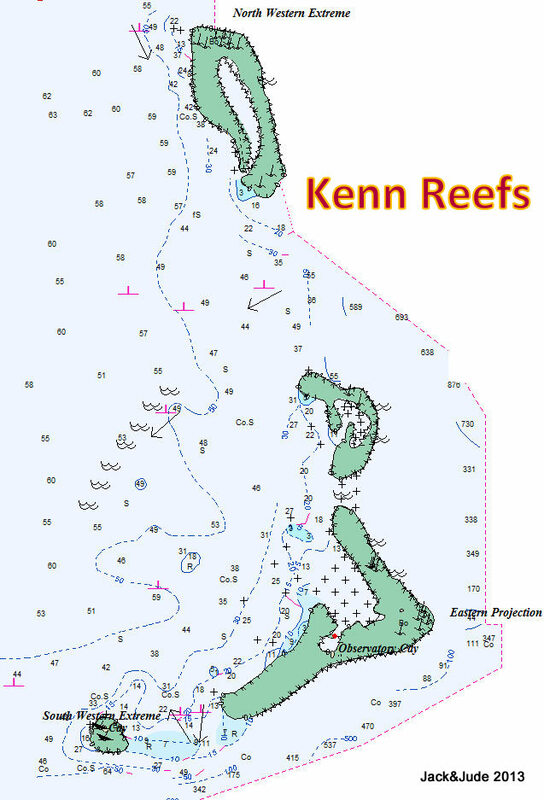 Located over 270 nm from the Australian mainland, Kenn Reef covers an area of approximately 40 km², shaped like a boot 8 nm long and 4 nm along its southern edge. 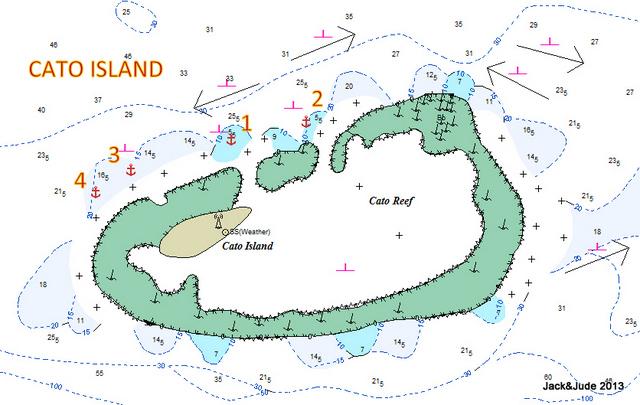 The southern reef is the largest with three emergent sand cays on the SW part. The only permanent land, tiny Observatory Cay, about l00 m by 50 m and 2 m high has no vegetation. We found an excellent anchorage for all winds except northerlies with easy access to these cays from an extensive shallow patch over the purest white sand. But getting to this anchorage requires careful visual navigation to avoid large numbers of coral heads before passing over a shallow sand spit. Yellow Buoy (Mooring?) off north side of SW Cay. Several wrecks on shore. 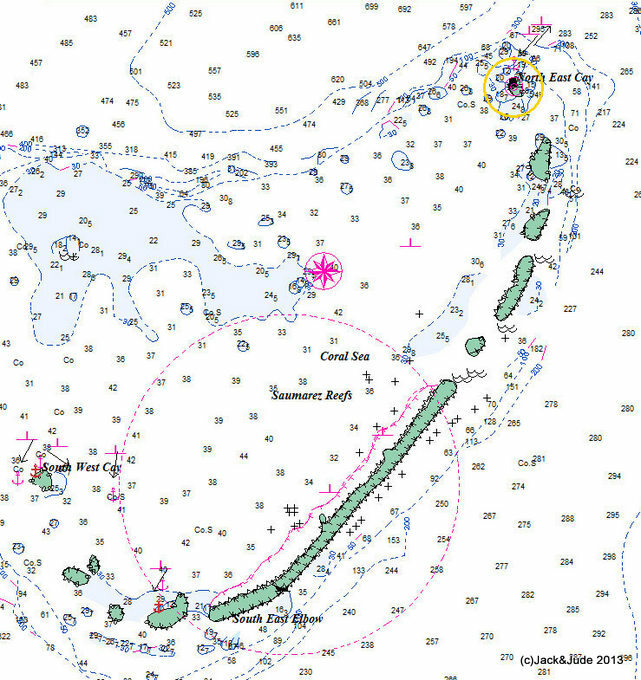 Anchorage good from NE > S > NW in 6 m sand inside coral lagoon with close access to Observation Cay, a raw un-vegetated islet, 2 others transient islets within a mile. Superb diving and fishing. Prolific bird life mainly Common Noddies, a number of Brown Boobies, and we saw one Frigate Bird. Old admiralty anchor exposed at low water near cay on eastern fringing reef may be from the Bona Vista, wrecked there on 18 March 1828. Capt. Robert Towns and crew spent several weeks on the reef before being rescued by the Asia. The outer edge is strewn with wrecks. Crystal clear water. Minimum of 3 m over a sand bar after depths of 6 to 10 m through isolated coral heads. Easy transit with good light. 2/ 21°14.419’ S 155°46.165’ E about 6 m deep over submerged coral. 6/ 21°15 066’ S 155°46.327’ E anchor anywhere in wide sandy basin. 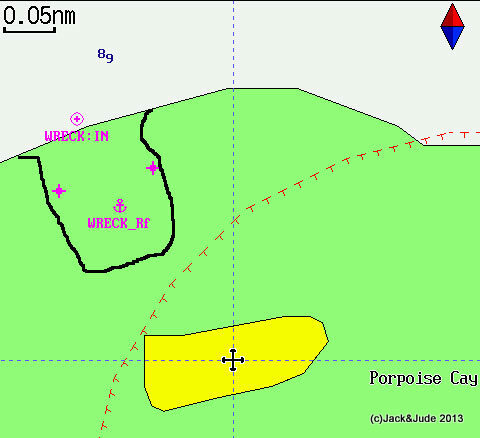 Exposed to SW thru N in about 8 m sand with submerged coral, opposite possible boat channel to cay. There are also two lagoons further north with entrances facing SW that are exposed to winter swell. We’d love to hear from anyone anchoring within them. Small sand islet on northern one. A complex of at least ten detached reefs over an area measuring 17 nm wide by 17 nm north to south lying in the shape of a hockey stick. There are many wrecks along its weather edge, with reasonable protection behind its barrier reef. In fine weather, anchorage behind the South West Cay would be the most interesting. In stronger winds, anchorage behind the South East Elbow would be better. Primitive islet composed mainly of shell and coral debris, provides excellent protection from SE Trade Winds. CAUTION: Our old charts show we exited over Danger Ridge – Do so at your own risk. 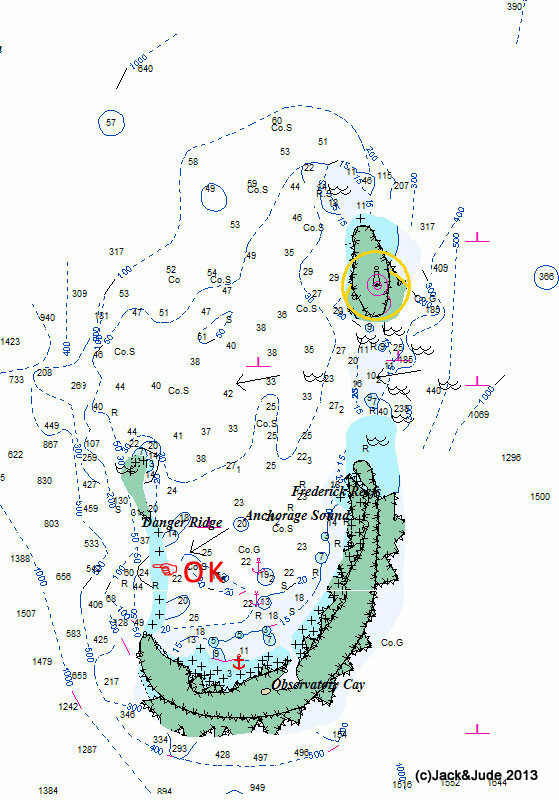 We noted on that chart a wreck on the SW reef edge, and a remarkable rock 4 feet high to the south near where we went over Danger Ridge. Whales were sighted in this area. 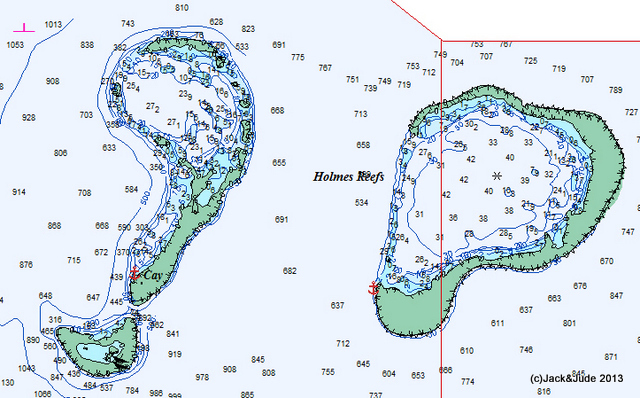 Is a horseshoe shaped reef with no islets, about 4 nm wide by 2.5 nm north to south. We have not tried to enter the lagoon, instead had an overnight anchorage off the northern horn where the tuna were running hot, the sharks equally fast. If you don’t mind anchoring with that mid-ocean feeling, then this is a prefect overnight stop. Take care as the ground falls away steeply and the currents run swiftly past the horns on spring tides. We would very much appreciate hearing from anyone venturing inside the lagoon. 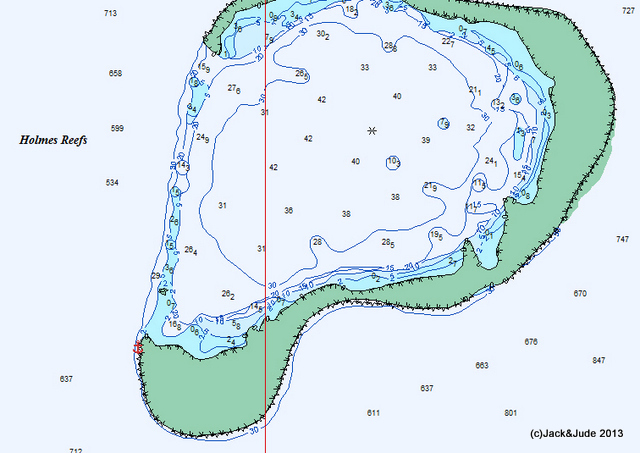 A complex of three detached lagoons over an area measuring 17 nm wide by 10 nm north to south. We have anchored off two; once off a lovely sand islet in fine weather, the other time hunkered down at the eastern reef against 35 knots SE, waiting to leave at dusk to make Euston Reef light at daylight and go through Grafton Passage to Cairns. The western reef with a sand cay may have offered even better protection from strong winds and has a castaway feel about it. 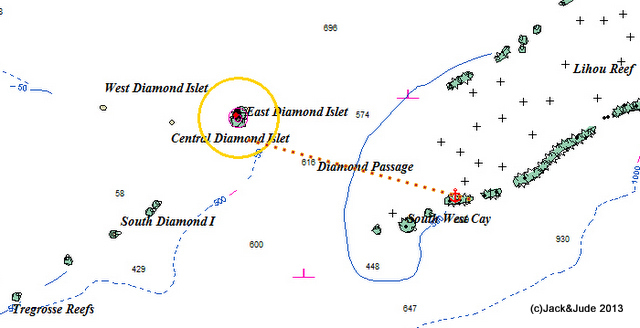 A tall SS automatic light structure and the many wrecks on the south reef make finding them easy. Both had great fishing. Last visited in the 80s. After eight days at Mellish we sailed for Lihou Reefs, 252 nm west using a light southwest wind that increased to 20 knots making our landfall rather bumpy. Lihou is a series of reefs connected by shallow, narrow passages, most are unsafe to enter. Our last night, when hard on the wind as we aimed for the last reef, those reefs were a dangerous lee shore getting closer and closer, robbing us of sleep. Nicking into the lagoon through overfalls was exciting, but we could not find an anchorage close to the nearby sand islet, forcing us to anchor behind the main barrier reef exposed to both sea and wind. The Banyandah sat comfortably enough, fortunately unaffected by current, bobbing up and down in 2’ to 3’ swell. The islet too distant to entice a visit, so we sailed next day. Protection from E thru SW in 12 m sand patch with submerged coral heads nearby. We had read East Diamond Islet has a spectacular anchorage, and in photographs we’d seen bushes upon which several species of seabirds were nesting. At the end of our day sail from Lihou, the breeze faded and we motored into a well-protected anchorage bright with white sand. A light structure rose out the cay and everywhere the air was alive with many species of seabirds, featuring the most Frigatebirds we’ve ever seen. A 2006 report put the numbers at 2,500 Lesser Frigatebirds, a thousand pairs of Red-footed Boobies and very large numbers of Black and Common Noddies, Masked and Brown Boobies, Black-Naped Terns, Sooty Terns, Wedge-tailed Shearwaters, several Red-tailed Tropicbirds and a few Great Frigatebirds. On shore several species were breeding, including the Frigatebirds and Red-footed Boobies, several different species in the same small tree, so our cameras rolled and clicked for the next five days. We climbed the light structure, and walked our GoPro down the cay, aloft on the parafoil kite. Jude in heaven when talking to all the creatures as we made a doco explaining the habits and features of each group. Good protection from NE thru SW in 7 m large sand patch with submerged coral heads nearby. Obvious boat channel to cay. A primitive sand cay, little or no vegetation with a narrow niche taken out the surrounding reef adjacent to the sand cay that provides reasonable good protection. Good for a night’s rest, but little else. During the 70s and 80s, we went to Willis Islets on three occasions and visited the weather station on South Islet each time, once during a 35-knot SE blow. Onshore, South Islet rises steeply to 3 or 4 coconut trees with lush vegetation that surrounds the buildings. They used to display a light from a building to assist night entry, but the passages leading into the anchorage are wide and clear, and with modern GPS, navigation should be straightforward. In the 80s, four weathermen manned the station for six months stints, so they were very friendly and accommodating, eager to show us around. Twice we setup amateur radio stations on this island as it has a rare call sign. Unless it has changed, we would highly recommend this as a friendly informative stop, but the protection is not the best. The anchorage, which is directly off the buildings and obvious boat channel, can be rather active in high tide/strong wind conditions. An alternative anchorage, slightly better in those conditions, is at the northern end of the islet. Depth as we recall is about 8 m sand bottom, no coral heads in the vicinity. In high winds, the boat channel can be dangerous. This is definitely one of the Coral Sea’s highlights. One of the larger reefs with a large sand islet enclosed within a lagoon that is the most distant from all land, 580 nm east from Cairns. Therefore wildlife is prolific. The anchorage is good for NW thru SW winds, although winter swell from the Tasman Sea can create a roll, especially at high tide. Beware! Boobies will land in your rigging. 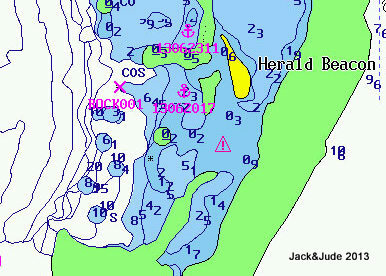 Protection from NW thru SW in 6 m coral sand, with minimum swinging room to a reef ahead. Close to a boat passage marked by an above water rock. We shifted 1/3 nm north to the other side of a reef awash in an attempt to lessen the southerly swell. Protection from NW thru SW in 6 m coral sand, with ample swinging room to reefs ahead and two submerged coral heads astern. An obvious unmarked boat passage dead ahead. If necessary, there is an anchorage with better protection from the SW in 8 m over sand. 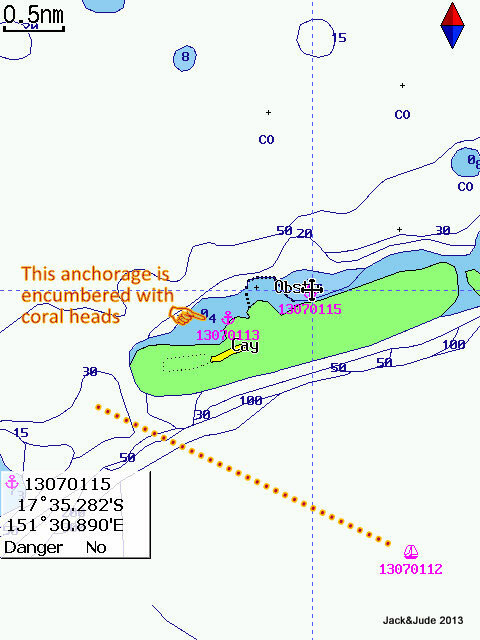 There is a coral head at 17°24.213’ S – 155°51.534’ E shown on some charts, but not others. The 233 nm voyage from Kenn Reef to Australia’s furthest bit of real estate took 54 hours of easy sailing, landing a scrumptious Green Job fish just after sighting its white line of breakers when only 3 nm away. Mellish Reef was the main focus of our 2013 voyage, and Heralds’ Beacon, its sand cay 600 m by 120 m rising just a few metres above the high-water mark was wildly active with clouds of seabirds as we anchored in 12 m fine coral sand near an above water coral boulder marking the boat channel into the lagoon. Banyandah had barely swinging room to reef awash ahead with breaking coral patches well astern. A nuisance southwesterly swell attacked our beam-ends, especially at low water, creating an uncomfortable roll. Our first footsteps on shore opened a floodgate of memories. We recalled ferrying base camp equipment and ham radio gear onto this very isolated sand islet, which had been devoid of all vegetation when last seen. A devastating cyclone early1982 had just passed, killing all the larger seabirds. Our hearts soared seeing it this time; well vegetated and crowded with thousands of seabirds. Brown boobies filled the sky above us, while White Masked boobies bobbed heads courting along the sandy fringe or they sat on eggs, or shielded frail featherless hatchlings. Several flocks of Common Noddies, numbering thousands, chatted noisily. But in far greater numbers were Sooty Terns, recognised easily by their triangular, white forehead patch, nesting in the low grassy vegetation. Our rough estimate counted 15,000 birds, far greater than ever seen. It was heart-warming to realise that Nature can recover when left alone. Heartening also because enough food must exist in the surrounding seas to support so many creatures, giving us hope that Earth can survive the human explosion. There are many routes to enter or exit the Coral Sea. Too many to describe all of them here. From the South, if departing from Bundaberg, Mooloolaba, or Lady Musgrave, a direct course can be taken under the Swain Reefs. If departing or heading for Cairns, we use Grafton Passage. It is wide, easy, and in the past we have had a favourable wind. 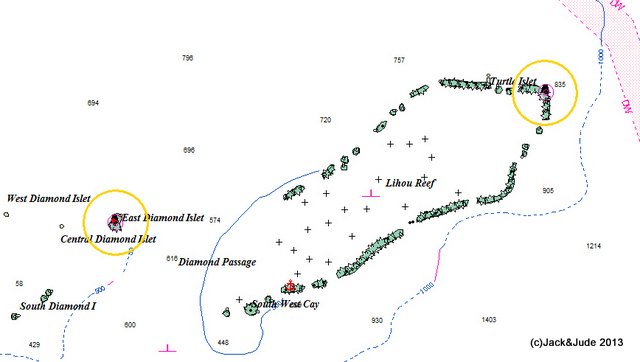 When returning to Cairns we plan to arrive at Euston Reef Light around dawn to make Cairns in daylight. Safe in strong winds. In 2013 we wanted to sail as far north as we could in the Coral Sea before heading for Cape York and choose Pandora Entrance as it has deep water until in the lee of the Great Barrier Reef. This proved wise as we were experiencing 30 to 40 knots SE winds. Raine Island Entrance, on the other hand, has a submerged coral barrier exposed to ocean swell. 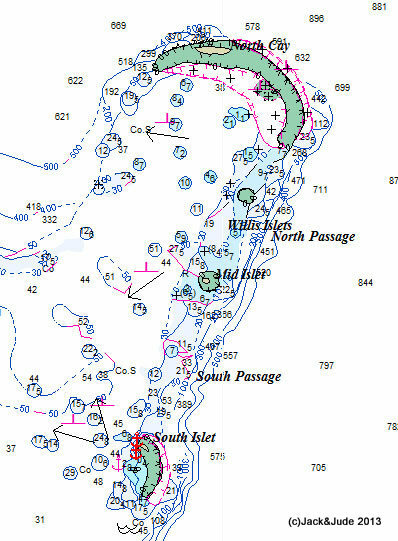 We rounded Moulter Reef at less than 1/2 nm, with a sand cay, an easily found landmark at its northern tip, sighting breakers a mile or two northwest. We took overnight anchorage 5 nm from Moulter Cay, behind an unnamed reef in a 12 m sand patch close to the reef exposed to 30 knot SE, several other reefs helping to block ocean swell. Next morning, we made a fast passage through the reefs, with one narrow gap between obstacles of 1.3 nm, to another unnamed reef close to the inshore shipping channel. Here we found excellent anchoring behind a low sand cay in 6 m sand and coral rubble. The water was turbid. From there we sailed direct for Mount Adolphus Island. 1/ 11°27.273’ S 144°07.235’ E about 2 nm off Moulter Reef elbow. 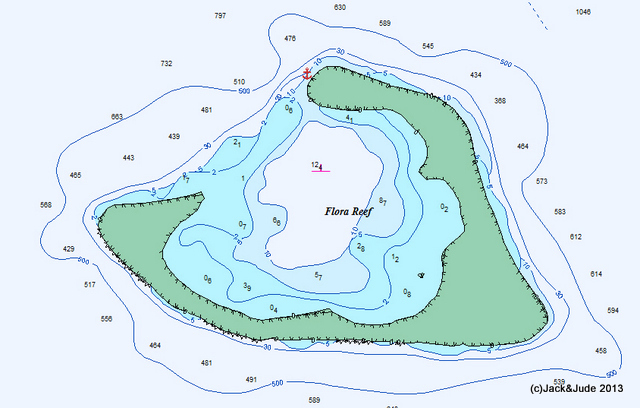 2/ 11°23.565’ S 144°01.832’ E about 1/2 nm off Moulter Reef north tip. 3/ 11°26.137’ S 143°58.996’ E midway between obstructions. Protection from NNE thru S in 12 m sand patch, with minimum swinging room to a reef ahead. 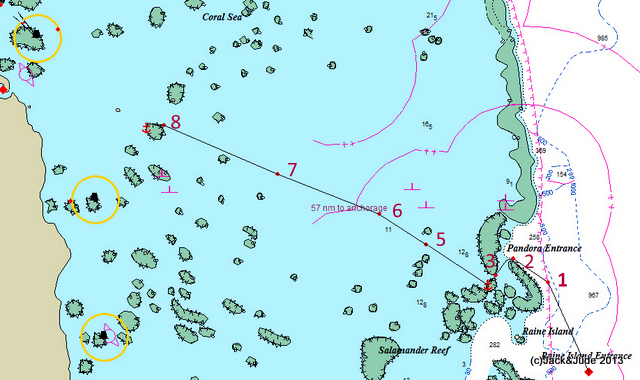 5/ 11°21.447’ S 143°48.087’ E to pass N of Maclennan Cay. 6/ 11°16.643’ S 143°40.648’ E a clear run. 8/ 11°03.005’ S 143°06.767’ E close aboard unnamed reef. Protection from E thru SE in 6 m sand and coral rubble. Shipping Channel in sight. Hello Andy, Sailing to Darwin via the Coral Sea is faster with less traffic, many anchorages are great for winter sailing. Porpoise, Kenn and especially East Diamond are great stops. Grab our Coral Sea Guide which works perfectly offline. This is a fantastic information source! Thank you very much for sharing. Our pleasure Pete. Beautiful and unique part of Earth. I am an airline captain who has for many years being flying routes across the Coral Sea between Australia and the Solomons – among others. And on most good weather days we can very clearly see the reefs, cays & islets at both Wreck & Kenn as we pass directly over them on the airway-track BNE-HIR. Over the years I have looked down on these locations with great interest, and regularly look to see if any visiting boats are anchored and enjoying these pristine spots – but it is hard to make out whether a white spot is a visiting boat or just a bommy with breaking water. And it is on a wish-list to one day be able to visit some of these places myself, rather than just look down on them from 30-something thousand feet of altitude. In my curiosity for learning more, I “stumbled” over your web site this morning, and have very enjoyed the read regarding your Coral Sea expeditions… something to definitely whet the appetite, and to enhance my enjoyment as I look down on these spots from the air. I shall also now browse with interest some more areas of your website about travels/work… Thank you. In closing… I have collected a selection of aerial photos from high altitude of Kenn & Wreck which I have attached. Many thanks Darryl. Your photos are great. We can even make out the entrance into the inner lagoon at Kenn. Appreciate your sharing these photos with us. Thank you so much for doing this. Great work and much appreciated. It’s a place dear to our hearts, we would be keen to hear of your voyage. Hopefully in a few weeks, a DVD of our journey through the Coral Sea should be ready, What a great adventure blessed with mostly good weather, our exit was a scorcher sail.